On International Women’s Day on Friday, March 8, the City of Los Angeles unveiled a new art exhibit at the LA City Hall featuring women-made artwork that tackles issues of domestic violence, human trafficking and homelessness. 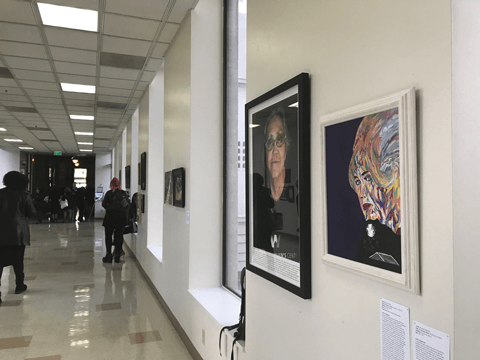 Located on the bridge of the third floor of LA City Hall, the exhibit — which is called “Shifting Narratives: The Strength of Women Survivors” — features paintings, photographs, collages and sketches made by women whose stories highlight the relentless frequency of gendered violence. 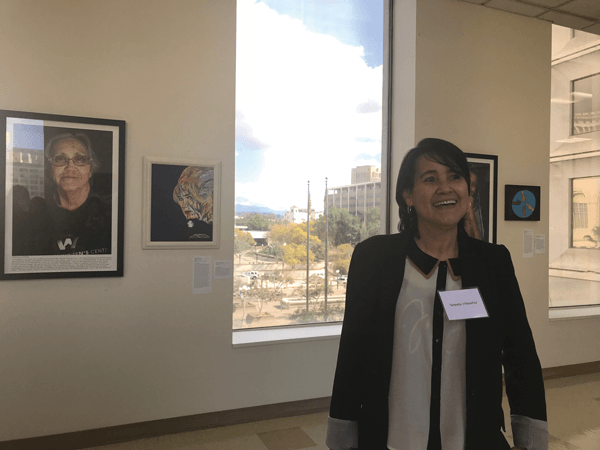 Among the artists showcased is Filipina-American Teresita Villasenor, a human trafficking and domestic violence survivor who is currently a member and advocate for the LA-based Pilipino Workers Center (PWC). 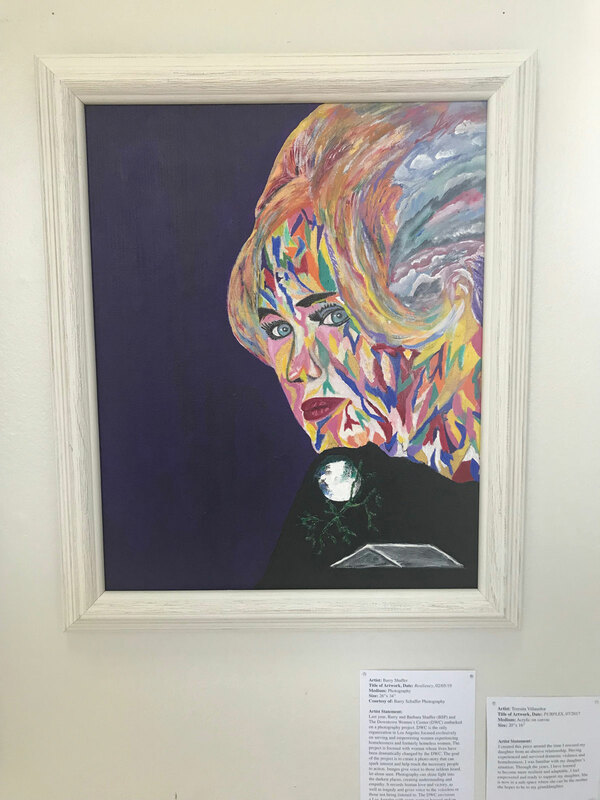 Her painting, called PURPLEX, features the portrait of a woman painted with a kaleidoscope of colors juxtaposed over a rendering of a dark void that represents a woman’s struggle. In that void is a rudimentary sketch of a moon over a roof, symbolizing the conflict of experiencing emotional confinement and silence in domesticity and eventually overcoming that. Painted in July 2017, the work was created around the time she rescued her daughter from an abusive relationship. As a survivor of domestic violence herself, Villasenor felt the need to address the tragic frequency of violence against women through creative expression. “I painted this at a time when I felt very oppressed. 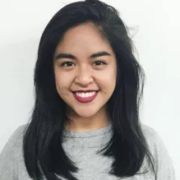 I never like to use the word ‘depressed’ because it’s just not in my vocabulary because ‘oppress’ signals taking action and doing something about this feeling inside,” Villasenor told the Asian Journal on Friday at City Hall. Standing in front of the 20” x 16” acrylic on canvas piece, Villasenor has the composed fervor of a politician and the oratory of an impassioned pastor, but she said it took her a long time before she could ever express herself in such a clear, unaffected way. Born in the Philippines, Villasenor was brought to the United States for employment. Like so many who are duped with the promise of fair pay and citizenship, Villasenor received neither. Instead, she slept a few hours and wasn’t given enough food to eat and frequently exploited and abused by employers. But that hardly touches on the traumas Villasenor had to endure in order to become the outspoken, tenacious women’s advocate that she’s become today. But the piece isn’t necessarily a pox on men and abusers so much as it is a reflection of feminine resilience that manifests itself in the most unexpected ways. It shines a light on women who have become displaced after escaping a domestic life of violence and the clear gender disparities associated with human trafficking and domestic violence. Today, Villasenor devotes her time to advocating on behalf of other domestic violence and human trafficking victims seek justice. As a survivor of an abusive marriage, recently Villasenor shared that she married a high school sweetheart and describes her life as a “Cinderella story” where she endured the worst to be able to live her best life in 2019. She hopes that PURPLEX inspires more women to speak out against violence and discrimination against women. But most of all, she hopes that if a woman who is enduring a life of domestic violence sees her painting that it reminds her that there is the strength to leave and that there is always a way out. In 2017, 1,305 cases of human trafficking were reported by the National Human Trafficking hotline, and 89 percent of those survivors identified as women. But what isn’t told is the volumes of stories and cases that have gone untold and unreported. “Shifting Perspectives: The Strength of Women Survivors” will be on display at City Hall for the entire month of March. If you or anyone you know may be a victim of domestic violence, you may call the Los Angeles County Domestic Violence Safety Plan Hotline at 1-800-978-3600 which operates 24 hours a day, 365 days a year. In case of an emergency, immediately call 9-1-1.